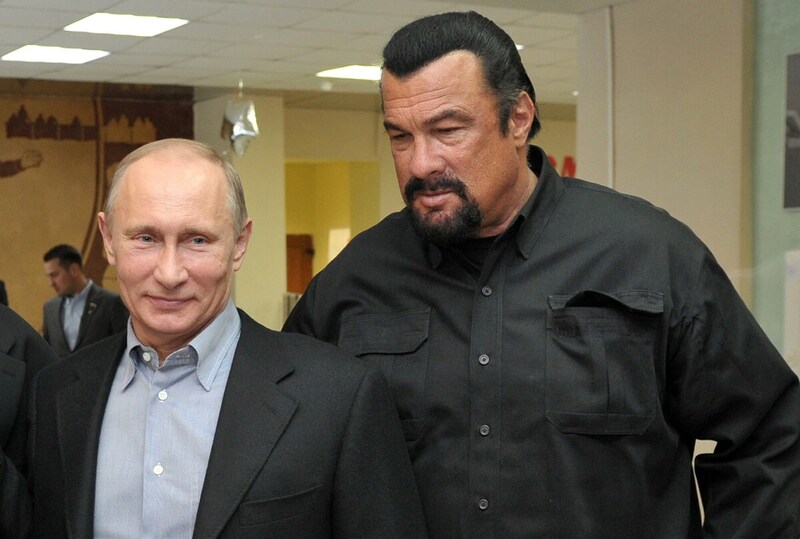 How Did Steven Seagal And Vladimir Putin Become BFFs? Bob Van Ronkel Introduced Them Van Ronkel has made a business of connecting show business stars with powerful and wealthy Russians. He was even in Moscow for the much-discussed 2013 Miss Universe pageant. Russia's President Vladimir Putin and American action movie actor Steven Seagal visited a newly built wrestling school in Moscow in 2013. Van Ronkel runs Doors to Hollywood, a company that brings American celebrities to Russia and other parts of the former Soviet Union. If an actor or musician traveled to Russia to hobnob with Putin or wealthy Russian oligarchs such as Deripaska, chances are he was involved. "I was hired to bring Steven Seagal to perform with his band for another event with President Putin, so kind of was responsible for that introduction, and Steven becoming best friends with him," Van Ronkel told NPR over dinner in Orange County, California, where he happened to be visiting. Ciro Orsini, a friend of Seagal's for more than 30 years, confirmed that Van Ronkel put Seagal and Putin in touch. Making this and other connections was his business for the years he shuttled between his base in Moscow and the West Coast of the United States, building bridges between Russia's elite and the show business world. That's why Van Ronkel had a front row seat to the 2013 Miss Universe pageant when Trump visited Moscow. Van Ronkel's life in Moscow exemplified the way powerful Russians sought to use celebrities to bolster their images and how Russian oligarchs sought relationships with celebrities as a public mark of true wealth. In some cases, it's still paying off. "For anyone to think that Vladimir Putin had anything to do with fixing the election, or even that the Russians have that kind of technology, is stupid," Seagal said on British television last year. Steve Hall, former head of Russian operations at the CIA, told NPR that even if Van Ronkel hasn't been particularly political, he is part of a larger effort that the Russian government has encouraged. "It looks very good for Russia because it shows that they are not alone in the world. They haven't been isolated, they indeed have these cultural connections. And they use it to basically increase their validity to the West," Hall said. "And it's a very clever move that they've done for a long time." Seagal's work in Russia continues to this day; he has helped launch a mixed martial arts fighting league there. Van Ronkel also palled around with powerful Russians, linking them with Hollywood celebrities — links that became marks of true wealth in a country already dominated by the ultra-wealthy. His clients paid him to bring over people such as Mike Tyson, Sean Penn and Kanye West — all shuttled to Russia or former Soviet states. "It was kind of a badge of honor to say, 'Look who I could get to come to my party, or my wedding or for my company's Christmas party,' " said Michael Hollomon, an American commodities trader who lived in Moscow at the time and was friends with Van Ronkel. Russian billionaires' willingness to cover the costs to party with their A-List guests sent the message about how much wealth and power they had accrued. "The prices were were incredible," Hollomon said." "The numbers that people would pay for that stuff ... it just gave you instant credibility." Take for instance, one episode in the early 2000s, when Van Ronkel introduced comedian Jim Carrey to Russian oligarch Oleg Deripaska — they partied together for days. Deripaska was recently sanctioned by the United States for benefiting from a Russian government that participates in "malign activities." "We did have an amazing weekend, four or five days; Oleg ended up hosting everything. Just really fun times with Jim, who was hysterical ... Oleg loved him — how could you not, with that over-sized personality that is Jim Carrey?" Hollomon told NPR. Deripaska later told Hollomon, "This is the greatest night of my life," as Hollomon remembered. 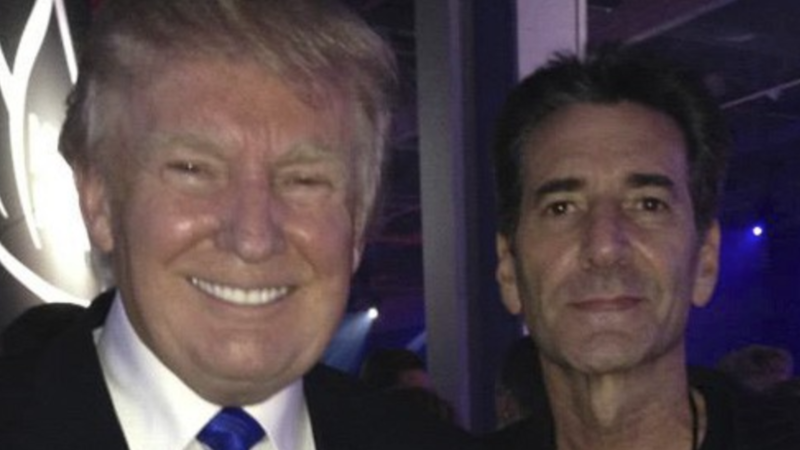 Donald Trump and producer Bob Von Ronkel at an after-party for the Miss Universe competition in Moscow in 2013. Van Ronkel's work and stature meant he was was present during the 2013 Miss Universe pageant, and helped guide NBC executives who were in town for the event. In one photo, he's pictured with a grinning Trump. That pageant figures in the salacious and unverified claims of the Steele Dossier, which claims that the Russian government has dirt on President Trump. But Van Ronkel told NPR he saw no indication that anything untoward took place. "He was bored at the after-party. He would have rather been talking with the president of Russia or some wealthy Russians about doing business," Van Ronkel said. As far as he's aware, he said, Putin and Trump never connected on that trip. Van Ronkel also became close to Russian intelligence, as he spent years trying to gain the trust of spies so that he could get the rights to put together a television show about the KGB, the former Russian spy agency. "It took almost two years. But he got in there with the Russian government and got the thing done ... As bad as the relationships got between the governments, they always liked American celebrities. And Bob was always very wired in Hollywood," said Larry Jacobson, a television producer who was a partner of Van Ronkel's on the proposed show. The show never found a home even though Jacobson pitched it to nine networks. Perhaps the issue was timing. Van Ronkel's tale is one of the booming Russian economy of the 2000s — but that moment has passed. The Russian economy has stagnated over the past decade and its currency has collapsed — partly in response to the bite of American sanctions. "The sanctions, the price of oil dropping so much, and the ruble almost doubling — just everybody was starting to have all kinds of financial problems," Van Ronkel told NPR. "Russians that would give me a million dollars to bring Mariah Carey, KISS and a lot of others like that — they didn't have the money. It would cost them twice as much in rubles." Today Van Ronkel has moved back from Moscow and lives in Las Vegas. He still runs his company connecting Hollywood and Moscow, but business is slower. The market for American celebrities in Russia, much like the relationship between the two governments, has grown cold.